Niki Lauda extended his lead in the world championship to ten points with an emotional win at the German Grand Prix exactly a year after he had almost died in a horrific accident in the same race. "I have finally killed off the ghost of that crash forever with this win," he said. Largely as a result of Lauda's crash in 1976, the infamous Nürburgring had finally been ditched on safety grounds and so the German GP had a new home at Hockenheim, hosting the event for the first time in seven years. There was a certain irony as the track had been condemned after the death of Jim Clark in 1968. Lauda took flack from the local media in the build-up as they accused him, very unfairly, of causing F1 to ditch the Nürburgring. The race was uneventful. Jody Scheckter put his Wolf on pole and led from John Watson with Lauda, starting on the second row, third. Lauda eased into the lead on the 13th lap and only briefly looked troubled when around halfway, for no apparent reason, his four-second lead over Scheckter disappeared. For a lap the Wolf was all over the Ferrari before Lauda once again pulled clear. It had been predicted beforehand the circuit would be hard on engines and so it proved with a string of retirements and by the end only six cars were still running. 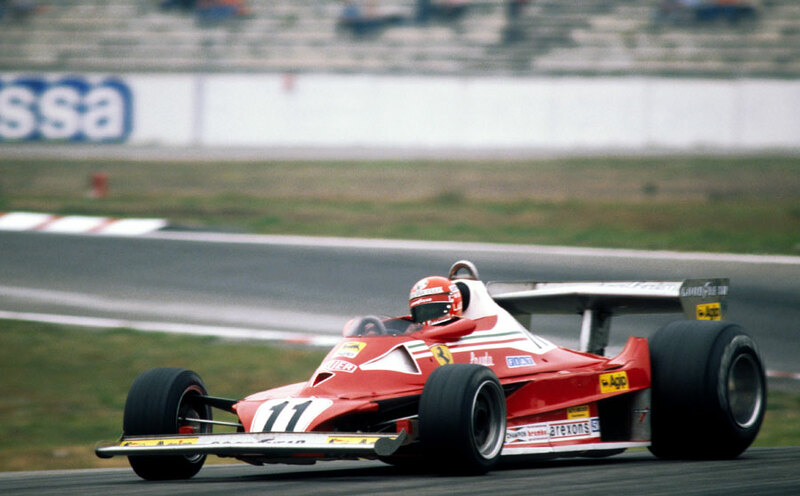 Scheckter and Hans-Joachim Stuck both spluttered round the last lap on empty tanks to take second and third, while Carlos Reutemann was a lonely fourth.